Natto maybe one of the most challenging Japanese food for those who are not familiar with the smell and the stickiness or sliminess. Natto is made from fermented soybeans. It is highly nutritious and is commonly eaten in Japan for breakfast with a bowl of rice. 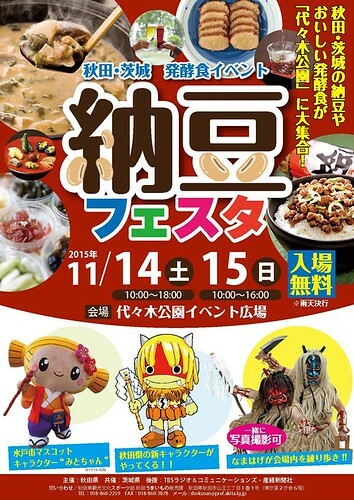 On 15th and 16th October, Natto Festival is going to be held at Yoyogi Park near Harajuku station. There will be natto and other dishes using fermented food such as miso and soy sauce. If you have not yet tried natto, this is a great chance! If you love natto, don’t miss this event!